If you are planning or thinking about leaving the Blue and Royals or have already have done so, then contact us today and we can give you advice and contact employers suitable for your skills and experience. Let us help you take the first steps to a new career. 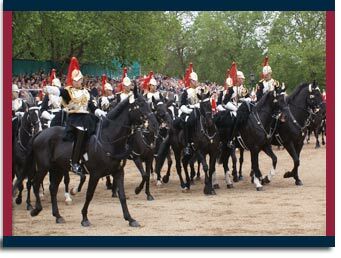 Royal Horse Guards (the Blues) and The Royal Dragoons (1st Dragoons), merged together in 1969 to form what is know today as the Blues And Royals. The Royal Horse Guards originate back to the English Civil War and were formed by Oliver Cromwell to tackle the Royalist Scots. The Regiment saw action in places like Battle Of The Boyne and Flanders in World War 1. During the reign of King George III the regiment was raised in status to that of the Household Cavalry and saw action in the Battle Of Waterloo. The other section of the Blue and Royals is the The Royal Dragoon, who were formed in 1661, in the reign of King Charles II and actually became Dragoons in 1683. They are named after a word derived from the DRAGON, which is a type of gun called a musket and is suitable in battle for infantry on horseback. This regiment has also been in many conflicts including the Crimea, Boer War, Flanders and more recently the Falklands War.